A wrist fracture has the potential to impact daily life for an extended period of time. Wrist fractures result from falls, sports activities and improper lifting. Owing to the complex architecture of the bones, muscles and ligaments in the wrist and hand, healing can take a while. The wrist itself is not a bone, but a joint connecting the hand and the forearm. The type of treatment will depend upon the nature and the extent of injury to the bones, muscles and ligaments. Typical symptoms include pain, swelling and bruising especially with movement. In some cases, nerve involvement can result in a tingling sensation in the fingers. It is important to rest and restrict motion to allow the injury to heal and to prevent displacement of bone fragments and other complications. Wrist fractures are typically treated by applying a cast that holds the wrist in place, provides protection from movement and helps reduce pain. At times, surgery may be required. Exercise – After removal of the cast, patients may experience some discomfort and weakness as they start to use their wrist again. A customized physical therapy exercise program is a critical component for easing pain and building strength while restoring functionality and dexterity in the affected area. Hot and Cold Therapy – Hot and cold packs are used to alleviate pain and swelling once the cast is removed and throughout rehabilitation. Mobilization – A therapist at Monmouth Rehab Professionals in South Amboy, NJ performs manual therapy techniques to relieve joint stiffness and restore a normal range of motion. Ultrasound – Soft tissue is stimulated below the surface of the skin using audio waves to accelerate the healing process through cellular regeneration while decreasing pain and swelling. Electrical stimulation – This method is an effective tool for alleviating pain, strength training and rehabilitation for joints that have been inactive for extended periods of time. Therapeutic Massage– Therapeutic massage offers many benefits. It can relieve stress in stiff joints (giving the patient a better range of motion) and enhances the body’s own ability to heal itself. Depending upon the needs of the patient, a variety of massage techniques can be used to reduce inflammation and relieve pain. Often, patients seek over-the-counter painkillers to deal with wrist pain, since it’s an inconvenience. Sometimes, patients are reluctant to schedule time to have a wrist examination, despite significant pain. 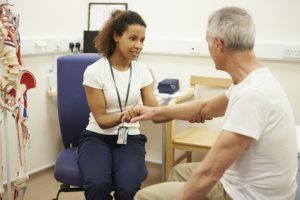 Getting the wrist checked as soon as possible is important since it can help avoid serious complications down the road. Wrist fractures are painful and affect the ability to perform daily tasks. Without proper strengthening and rehabilitation, recovery can be a long, painful process. If you are experiencing pain from a wrist injury, we at Monmouth Rehab Professionals in South Amboy, NJ can create a customized treatment plan that will reduce pain, restore mobility and facilitate recovery. Call us today to ensure a quick and speedy recovery. This entry was posted on February 2, 2018 at 3:20 pm. You can follow any responses to this entry through the RSS 2.0 feed. Both comments and pings are currently closed.